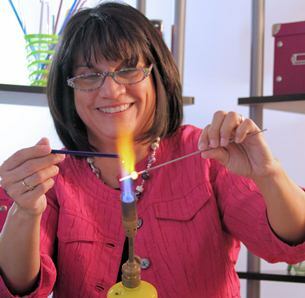 It is really easy for those who frequent craft stores to get home after their purchase and be nothing but discouraged. It is not that they are unhappy with the treasures they have purchased, it is in the realization that they do not have the same great display shelves or storage capacity a store has. Wouldn’t we love aisles, bins, baskets, shelves, rotating displays, hooks, etc. in our home craft areas? The problem for many is that we “stuff” our stuff, and don’t “store” what we got from the store. To be productive, you need your supplies readily available. Taking initial time to be organized in your work space will save you time for your creations later. 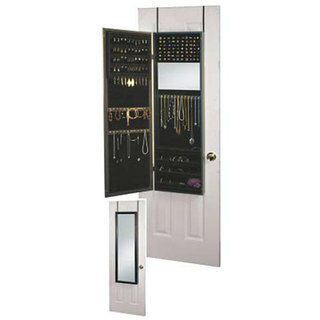 If you are organized at the start of a project, you will have quick access to your items. You will then not waste time trying to remember where certain items are. Color codes, or file and label systems can work for just about any type of craft you need to manage. 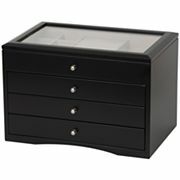 Once, instead of labeling many mini drawers with individual stickers, I thought that I would just memorize where items were. That was possible for me to do but, when I was tired, the memory wasn’t as sharp. I ended up wasting more time trying to recall because it was not a consistent quick process. If you take time to be organized in your workspace, your items will have a greater chance of staying in a new or working condition longer. Take time to care for items by storing them in a proper manner. Correct storage and containers allow you to potentially avoid situations dealing with broken, torn, dulling, drying, fading, misplaced, or hazardous materials. It is a safe practice to safeguard your investment in your supplies. It is a fact that if you have a passion for a particular creative outlet…you want supplies, need supplies, have supplies, collect supplies, hoard supplies and store supplies. Once we buy supplies, we are not really in the mood to spend additional funds on storage containers. We would much rather spend that money saved on more supplies! I have invested in a few inexpensive methods for my bead storage system. Some of my storage containers are also recycled and that saves on the environment as well. I have taken a few photos to share some of my easy solutions. Maybe it will work for you as well to adopt or adapt the same methods for your storage challenges. 1. After the spice rack was empty, I converted it into a revolving caddy for the items that I use on a regular basis an need close at hand. The clear containers allow me to see exactly what I need. The revolution of the stand allows me to grab a container quickly. The label is also on the top so I can read what is on the outer side of the caddy with ease. 2. Speaking of spices…I often use whole cloves in my wreath crafts and in home-made potpourri, so when I buy that supply and use it up, I wash the container it came in and take the label off. The one ounce container is great for small items with a low count. The BEST part of it is when I open the lids, I can usually still get a slight scent of cloves! I label the top to identify. 3. The initial idea with the small round favor tins was to hot glue the magnetic strips on the back of that container and then secure the see-through lid on and place it upon a metal sheet directly on my wall. The only problem with that idea was that my items were generally heavier than what the container could hold and it slipped down or fell often. Plan “B” is what I still use today instead. 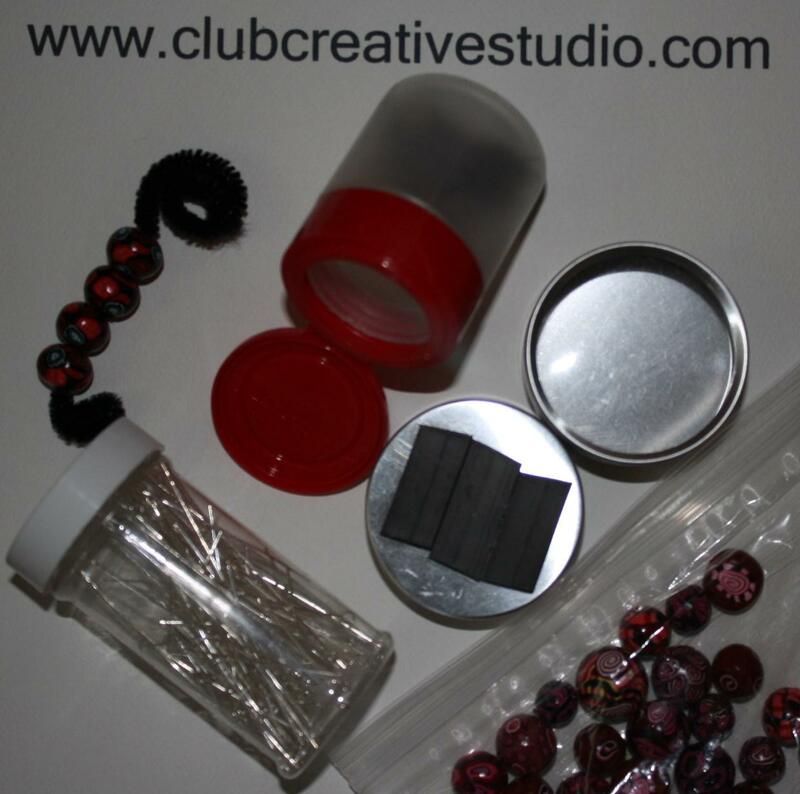 The same bead-filled magnetic bottom tins grasp onto an old cookie sheet. Each sheet holds 40 containers and they stack. 4. Many times I use zip-lock baggies. The snack size are great to grab onto if the content amount is small or if you want to group something by colors quickly. Large quart sized baggies are great for protecting larger items and the larger sizes can even protect papers from liquids. 5. The image that you see with the strung beads is a pipe cleaner with beads on a small section, the ends curled inward. This is my way of organizing my groups of hand-rolled clay beads. I can grab any strand quickly, compare it next to a different bead, remove and replace it easily and best of all see at a glance how many I have to work with. This is important for me since my beads are in limited quantities and I have to plan for the amount I can use. Maybe you or someone you know uses or stores beads or other small objects. Share this site with them for the tips. I challenge you to adopt, adapt, or announce your storage solutions in a comment to this post. Happy housekeeping!